482. Gas regulator (Powers’s patent) for equalizing the supply of gas to all the burners of a building or apartment, notwithstanding variations in the pressure on the main, or variations produced by turning gas on or off, to or from any number of the burners. 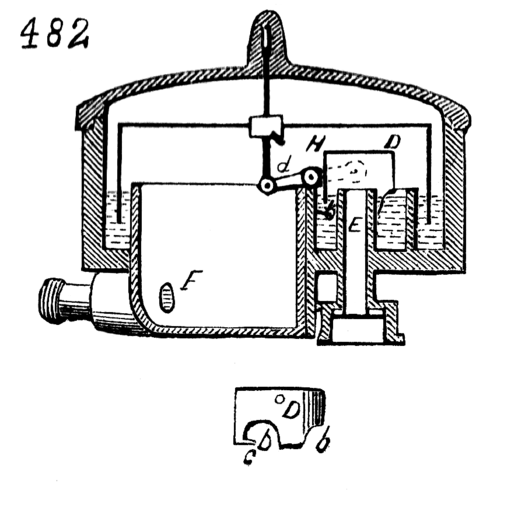 The regulator-valve, D, of which a separate outside view is given, is arranged over inlet-pipe, E, and connected by a lever, d, with an inverted cup, H, the lower edges of which, as well as those of valve, dip into channels containing quicksilver. There is no escape of gas around the cup, H, but there are notches, b, in the valve to permit the gas to pass over the surface of the quicksilver. As the pressure of gas increases, it acts upon the inner surface of cup, H, which is larger than valve, and the cup is thereby raised, causing a depression of the valve into the quicksilver, and contracting the opening notches, b, and diminishing the quantity of gas passing through. As the pressure diminishes, an opposite result is produced. The outlet to burners is at F.